Over the past two weeks we have explored sources of sugar in food and how different types of carbohydrate affect our health — by referring to the glycemic index. This week I will outline your considerations concerning added sugar. I certainly don’t advocated quitting sugar, but caution is required. We add sugar to our drinks and food, plus we eat it in processed foods. It is easy to keep track of how much sugar we add to our food and we can read food labels, but it can be more difficult to account for sources added to baked-goods eaten at a café, such as muffins, cakes and slices. Ingredients list: ingredients appear in descending order, so the first ingredient listed is present in the largest amount and the last ingredient is the smallest. Sources of sugar added to foods include honey, molasses, glucose, fructose and dextrose. If any of these are listed for your product of interest, then the product has added sugar. Nutrition information panel: this provides the amount of total sugar present in the product (in grams), but it doesn’t separate added and naturally occurring sources. For example your product might be a fruit muffin, so sugar will naturally come from the fruit and flour, but it may also contain added sources. Other claims: if your product doesn’t contain added sugar it may state ‘no added sugar’. How do we use the food label information? If the ingredients on a food label doesn’t include sugar, you can feel confident that the only sugar present in the food is from natural sources. If sugar is listed, remember if it is at the start of the list it is a major ingredient. If there is more than 15g of sugar per 100g of food, then the product might have added sugar — check the ingredients list for sources of added sugar. The amount listed in the nutrition information panel provides a total amount of sugar present in the food per serve size and per 100g. Use the 100g amounts to compare products, and when referring to the amount per serve consider whether you eat the serve size, more or less of the product. 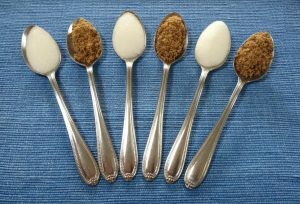 The World Health Organisation currently recommends that we do not eat more than 6 teaspoons of added sugar a day — 1 teaspoon of sugar weighs 4 grams. If you are eating more than 6 added teaspoons of sugar per day, as well as processed foods then it is very likely that you are overloading your body with refined carbohydrate and missing out on essential nutrients, phytochemicals and fibre. But, you can gradually reduce the amount of sugar that you eat and enjoy health benefits. Try halving the amount that you add to foods and drinks, and gradually substitute intensely sweet foods such as biscuits, sweets and cakes with foods that do not contain added sugar e.g. fruit and homemade muffins. Really take time to taste your food. Eat a piece of fresh fruit that is ripe and in-season. How does this compare to the sweetness of sweet biscuit, a piece of chocolate or glass of soft drink? With practice you can learn to recognise the intensity of sugar in food. You will find that in time your attraction for intensely sweet foods will lessen and you will savour the taste and pleasant after-effects of fresh fruit. Whole foods provide the nutrients and sustained energy that our bodies crave for.